Drew and I flew to Tel-Aviv and arrived around late afternoon on Saturday - which is slightly an issue given that it's Shabbat, and no public transportation is running. The only alternative was to take a taxi - which I have since learned is a great way to open yourself to getting ripped off. I'll admit that I'd gotten a little complacent with being on high alert throughout my travels, but here, you have to have your guard up to not get taken advantage of. 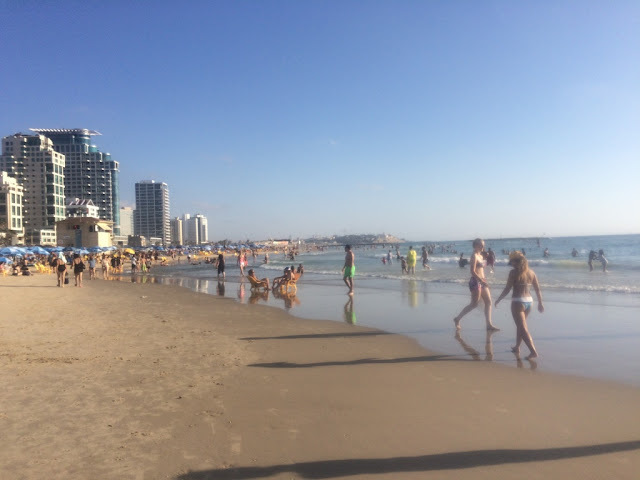 Tel-Aviv is basically a city that borders one long coastline/has a ton of beaches. It's like South Beach, in that it's kind of a cosmopolitan scene (choosing dinner options was like a who's who list of the world's trendiest cuisines), and you get a lot of vacationers, locals, etc. all strolling along the sidewalk up and down the beach. Made it to our hotel, then headed to the beach a block away. It was PACKED. 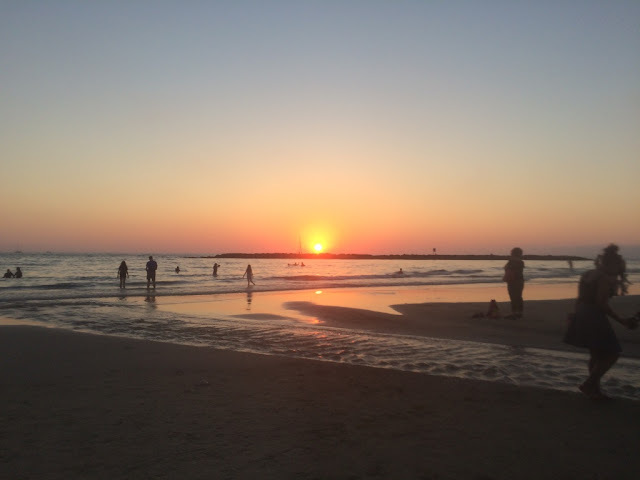 I'm assuming maybe because it was Shabbat, so families spend time at the beach together? 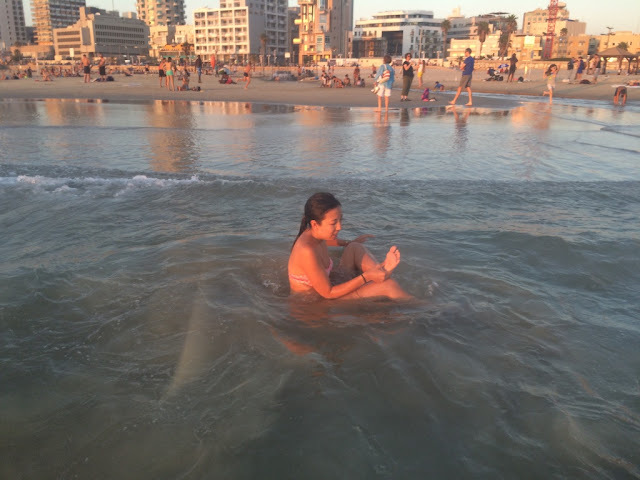 The sand was super soft and the water was warm and the waves were the perfect size - but to be honest, the beach was a little overcrowded and consequently, probably a little hard to keep clean. We did find some people and played a couple games of sand volleyball (no one spoke the same language, so that was a fun communication game), and got to swim in the waves. 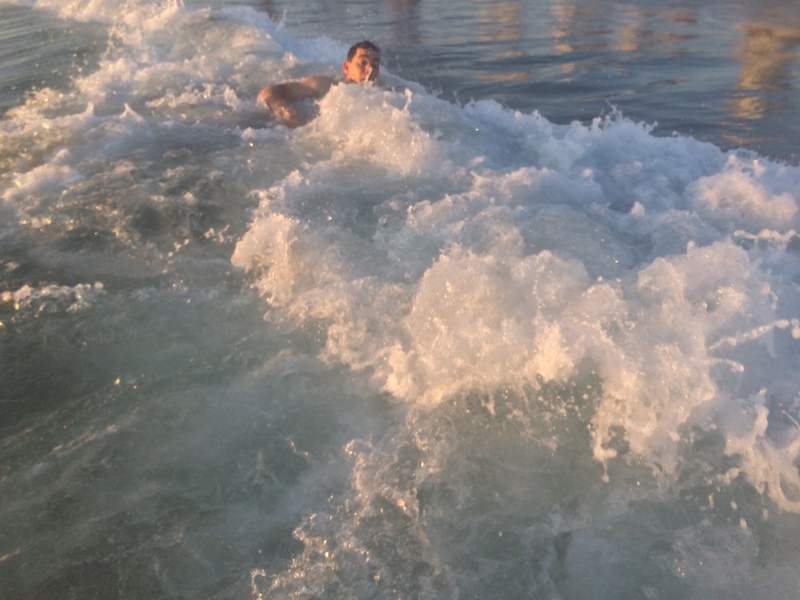 Drew attempting to bodysurf (Why is it called bodysurfing but then we also use surfboarding? Shouldn't it be board surfing for consistency's sake?). Walking along one of the main drags, there were tons and tons of restaurant/cuisine options, all very cute, and all with trendy outdoor seating. Knowing that another city was probably best to try true Israeli food, we just went with whatever we were craving. Which was Mexican. I used to not really be in love with Mexican food but I've changed my mind now; I'm obsessed with it and I love it and all I wish is that they would use some other lettuce besides the weird crimpy iceberg lettuce, but other than that - it's perfect. We ended up at Mexicana, mainly because it was hoppin' and nothing sounded better to me than an enchilada with mole sauce. It was delicious. I don't know if it's just that I haven't had Mexican food in so, so long, but basically it was the best meal ever and I went to town on it. Plus they had delicious cheladas (beer with lime and tabasco) and margs and LIME RICE. 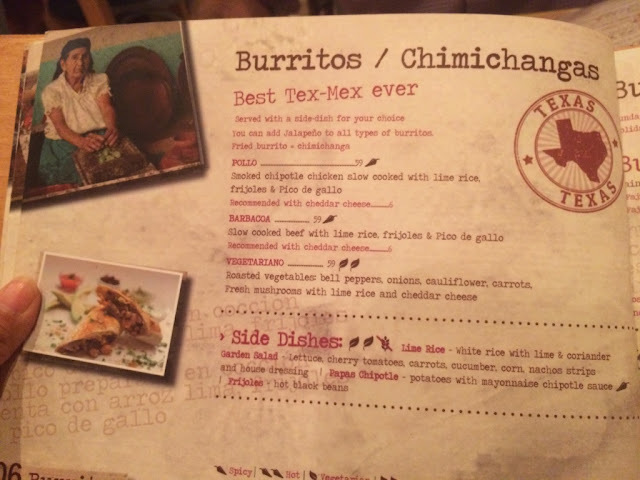 You know it's serious when a restaurant in Israel claims to have the "Best Tex-Mex ever"
THERE ARE JELLYFISH AT THE BEACH. Some little boy came into our hotel lobby with a jellyfish sting (though he was unfazed, might I add - or at least not bothered by it enough to not be a complete chaotic hurricane in the lobby by throwing his rubber ball at anyone and everyone's head), and then I saw a dead jellyfish wash up on the beach. Is it sad the only thing I know about jellyfish stings, I saw on Friends? Scratch that, I learned some from Finding Nemo too. The heads don't sting! 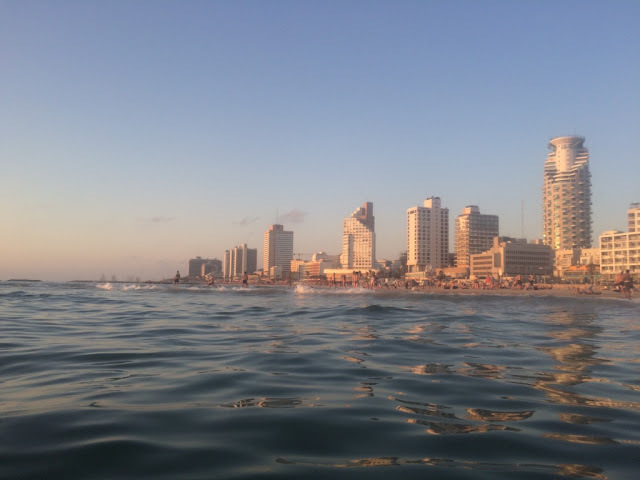 Short post today, because we weren't in Tel-Aviv too long before heading to Jerusalem the next day. So many things!